Peel Harvey Catchment Council turned on a great breakfast and gave locals 20 plants each this morning. About 100 people enjoyed the hospitality and the information provided by PHCC in spite of the cold and the wet. LCHRA President Jenny Rose, who also runs the local Landcare group, facilitated the event and the staff and volunteers from PHCC were highly organised and very informative. It was great to see so many old and new faces coming together and making or renewing friendships. 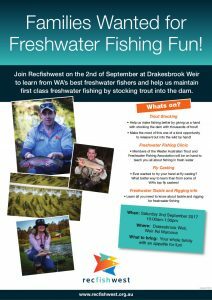 If you have any suggestions for events to bring people together please leave a comment or contact LCHRA through the web page. We would love to see 100 plus people at the hall on a regular basis. The Shire of Waroona will be conducting a bulk rubbish collection in August. Details are in the documents blow. Fox activity is on the rise due to successful rabbit control and the upcoming fox breeding season. 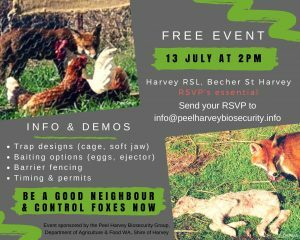 The Peel Harvey Biosecurity Group, in partnership with the Department of Agriculture and Food, WA and the Shire of Harvey, is holding a FREE Fox Control Workshop at the Harvey RSL Hall, Becher ST, Harvey on the 13th July. The events starts at 2pm. There is a playground at the venue so bring the kids along as well.